Custom Fluidpower (QLD) , a national hydraulic solutions provider offers an innovative handheld non-invasive fluid detection device designed to detect pressure in hydraulic hoses. The risk of workplace injuries involving fluid under pressure is very high and can also result in fatalities. High pressure fluid or oil in hydraulic systems is lethal if a fluid line connection point is opened or hose failure occurs. These fatalities and the absence in the marketplace of a handheld non-invasive pressure detection device that could detect whether a hose, tube or pipe was under pressure were the reasons behind Custom Fluidpower’s research and development project. 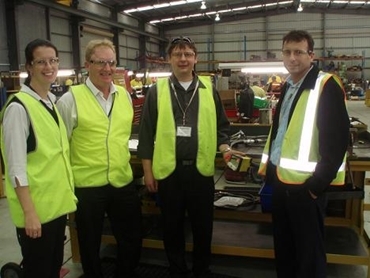 Funded by the Australian Coal Association Research Program (ACARP), the project commenced in 2007 and has now resulted in the invention of a patent-pending working prototype. “This information is critical in performing isolation procedures in hydraulic circuits where it is not possible to connect a pressure detecting device to measure the pressure in contact with the medium or hydraulic oil,” said Mr Schintee. “Using the Portable Detection Device the operator can substitute the hazard of disconnecting a hose under high pressure with the risk of disconnecting the hose under low pressure. This risk is more manageable and the risk of personal injury is lower,” Mr Martin said. The Portable Detection Device operates by applying a safe level of deformation to a hydraulic hose with a clamping device and measuring the deformation of this hose. The device then compares this deformation with data stored in its memory and issues a low pressure, high pressure or re-test notification. Efforts are on at Custom Fluidpower to refine the prototype and make it market-ready in an intrinsically safe model.